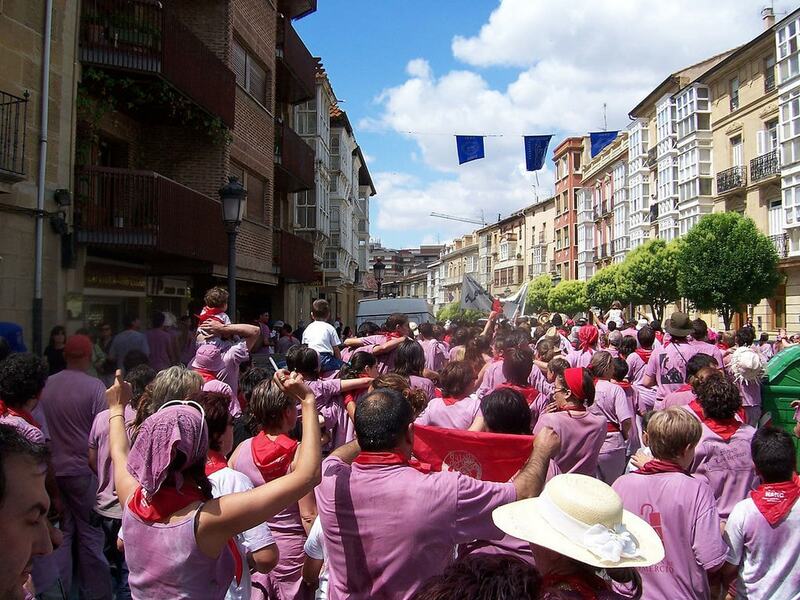 Northern Spain‘s famous Batalla del Vino (‘Wine Battle’) is one of the world’s biggest food and drink battles. 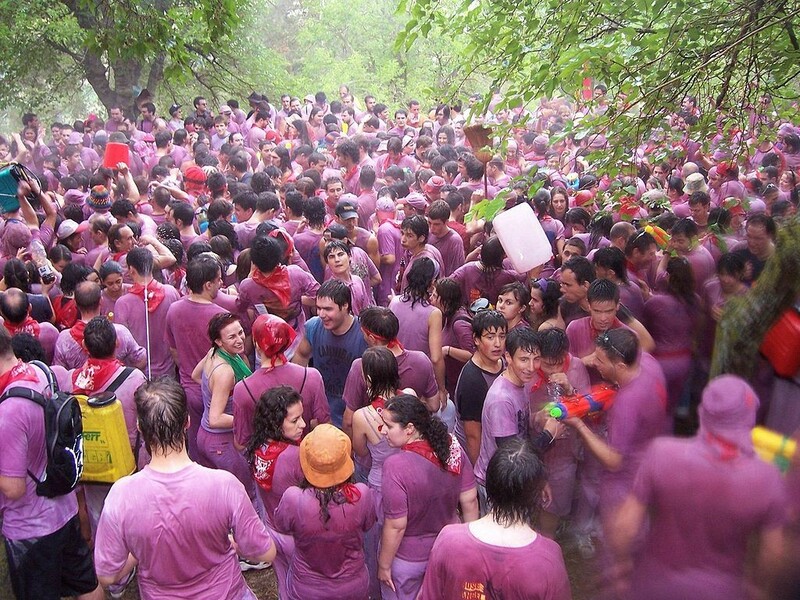 During the event in La Rioja, more than 500 litres of red wine are thrown into the air with the aim to soak as many people with the sticky red grape juice as possible. Here’s everything you need to know. When and were does it take place? The Batalla del Vino – literally translated as ‘Battle of Wine’ – takes place just outside of the small town of Haro, in the heart of the La Rioja wine region. 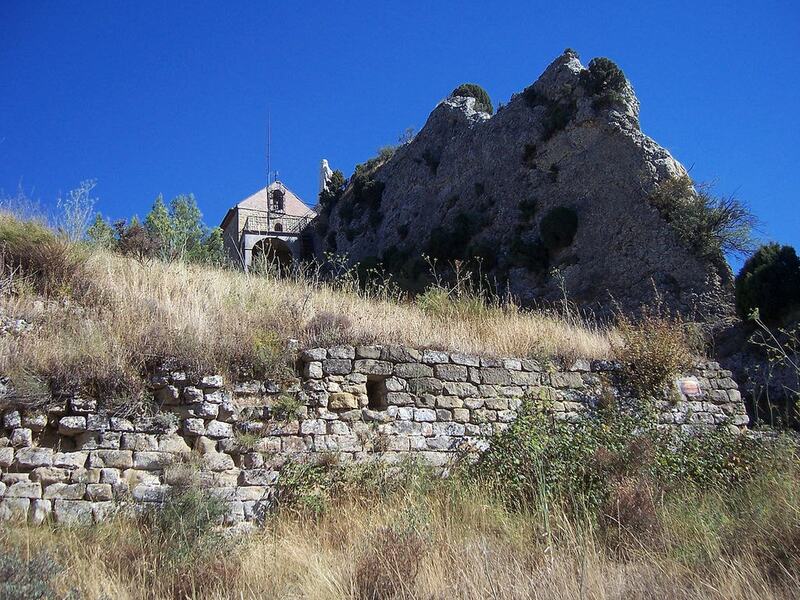 The actual battle takes place approximately 6 kilometres (3.7 miles) outside of town in the Riscos de Bilibio hills. The event is held every year on June 29 and celebrates the saints of San Juan, San Felices and San Pedro. 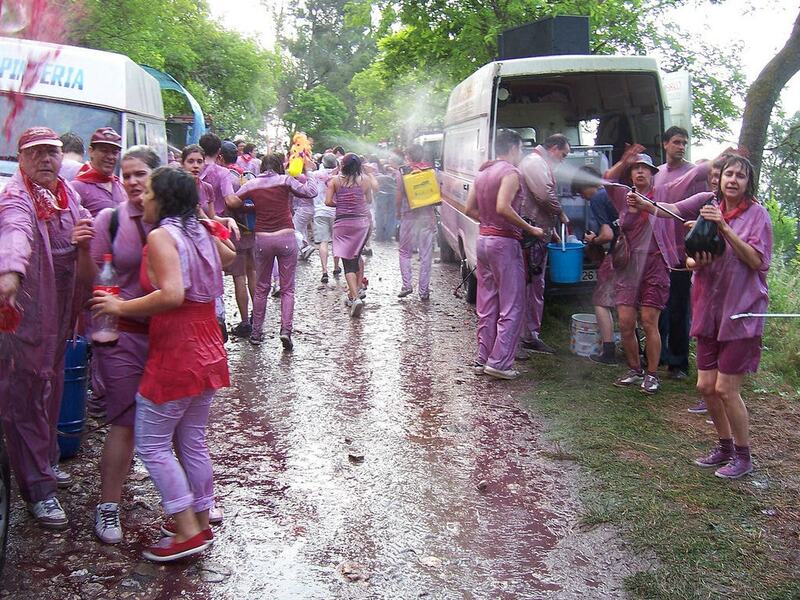 During the event, locals and visitors alike gather together for the world’s biggest wine fight. In the morning, everyone attends mass before heading out of town to climb the Riscos de Bilibio, which lie in the foothills of the Obarenes Mountains. An area full of strange rock formations, it is here that the battle begins. The aim of the fight is to cover each other in so much wine that everyone’s clothes turn purple, and no one is left wearing white. At noon, the fight stops and everyone begins to feast on snails and lamb chops. The party continues back in Haro with live music, dancing and street stalls. It is said that when San Felices de Bilibio died in the 6th century, people began to make pilgrimages to the spot where he was buried in the caves of Riscos de Bilibio. This tradition continued for hundreds of years, and chapel was built there in the 18th century. It wasn’t until the 20th century, however, that wine baptisms began to take place here, and as time passed, these turned into wine celebrations and eventually the wine battle was born. What do I need to know if I want to join in? To join in the wine fight you must wear all white and tie a red handkerchief around your neck. Make sure you take clothes that you don’t mind getting ruined, as those red wine stains are unlikely to come out. Also remember to bring some type of container with you, so you can fill it up with wine – bottles, jugs, buckets – anything goes, as long as it’s plastic and not glass. The best source of ammunition however, is a water pistol. If you’re planning on staying overnight, remember to book your accommodation in Haro well in advance, as accommodation books up fast.